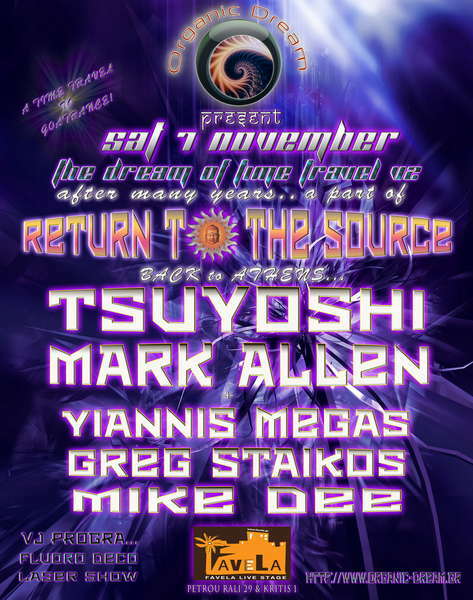 ORGANIC DREAM present on Saturday 7 November..
"The Dream Of Time Travel v2" .. a time travel to Goa Trance! After many years, a part of "RETURN TO THE SOURCE" back to Athens! DJ TSUYOSHI is co-founder of the legendary trance label Matsuri Productions. London ( '94-'99 ): You probably know him more as an international techno-trance dj. He was the resident DJ at the Return to the Source in England in 94, and has played some of the biggest electronic events in the world including the Berlin Love Parade, The Sydney Mardi-gras, Fuji Rock festival, Tribal Gathering, Fenix festival, Rainbow 2000, Earthcore and Return to the Source. He has also released some his own albums and singles and various mix CD's and was the musical director for ISSEY MIYAKE and VERSACE. In 1999 he started the monthly night at NYfs ARC(ex-VINYL,TWILO). He returned to his home town of TOKYO in 2000 and started his own regular party TOKIODROME (www.tokiodrome.com). Mark first got into psychedelic electronic dance music in 1991 , during his first visit to Goa . Many travellers from all over the world converged on the palm fringed beaches to relax and to dance to music that people had brought with them on cassette . He returned to London after 6 months in India to start training as a solicitor , but the mission closest to his heart was to collect all the music that he had been inspired by in Goa He bought himself some Technics turntables and together with a small group of friends , started putting on small private parties in friends flats. These events evolved into the renowned "Pagan" parties , which are still going strong on the London underground scene . In 1993 , after qualifying as a solicitor , he spent another 6 months in India , during which time I decided that he had to make Djing and creating music his main thing . The double-life was not going to work and he had to pursue what he enjoyed most . Simon Maine and John Ford to form the techno outfit "Mindfield". The next year gave Mark his first taste of live gigs and record releases but his DJ career really took off when "Return to the Source " started in the summer of ’94 at North London’s Rocket Club. The success of the early parties confirmed that the time was right for psychedelic trance music to reach a wider audience. Too many people had been inspired by the music for it to remain exclusive to a small tribe of travelling party people.Having changed venues several times, following the closure of the Rocket, from 30th April, RTTS will once again be there on a monthly basis. The Trance community continues to grow steadily throughout the world and Mark has been making the most of the travel opportunities this has provided. 1996 and 1997 included many trips to Greece , France and Switzerland , gigs in Germany ,Spain , the Burning Man Festival in the Nevada desert and two Source parties in New York , Israel , Italy , Berlin (on Love Parade day) and Belgrade for open air parties, Guadeloupe and to Japan for the incredible outdoor Return to the Source party at the foot of Mount Fuji, Ibiza, San Francisco and the three day ‘Boom’ trance festival in Portugal . The first CD Mark mixed and compiled was in 1995 , being the first in the "Deck Wizards" series on Psychic Deli Records. This was followed by 'Sonic Initiation' on Kickin’ records. Mark recently finished his third CD mix, the second volume in the ‘Shamanic Trance’ series from Return to the Source. This was released on the Positiva record label in March 1998.
" Dont need words to pronounce the oldest psytrance radio producer and dj in greece"
"...no comment about this monster!" *ORGANIC DREAM present "The dream of time travel v2"
in 0.094 seconds server time.